QPost have really excelled themselves this time! 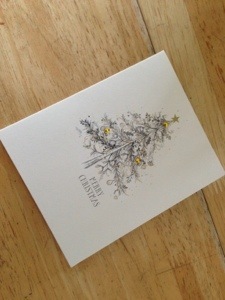 On Wednesday 4 September, I received a Christmas card. Yes, you read that right: Christmas. 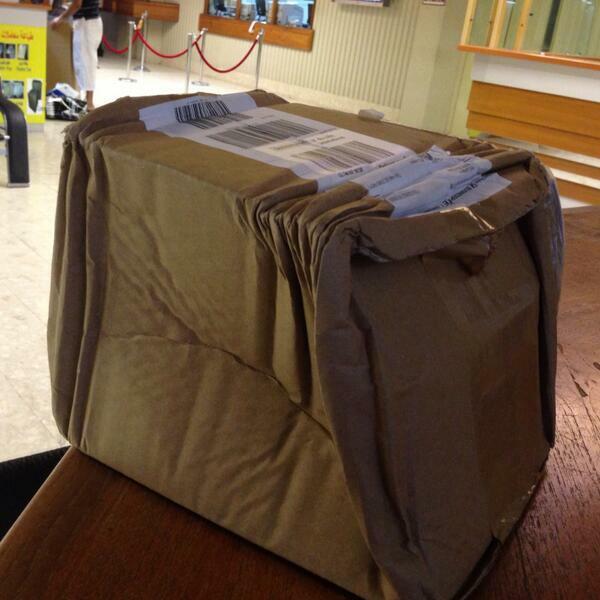 I got a parcel yesterday. How excited I was, as I skipped down to the post office. 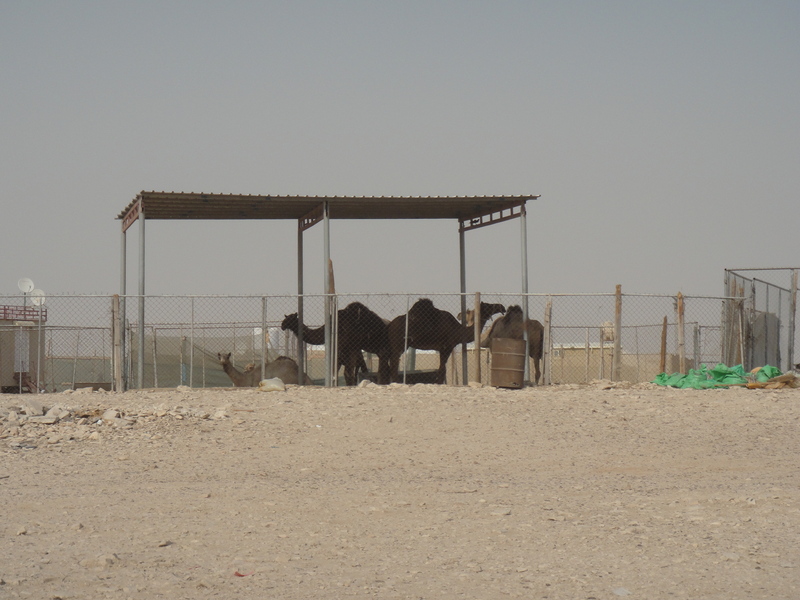 I didn’t realise all parcels to Qatar had to be stamped on by a passing elephant before they could be approved by customs. 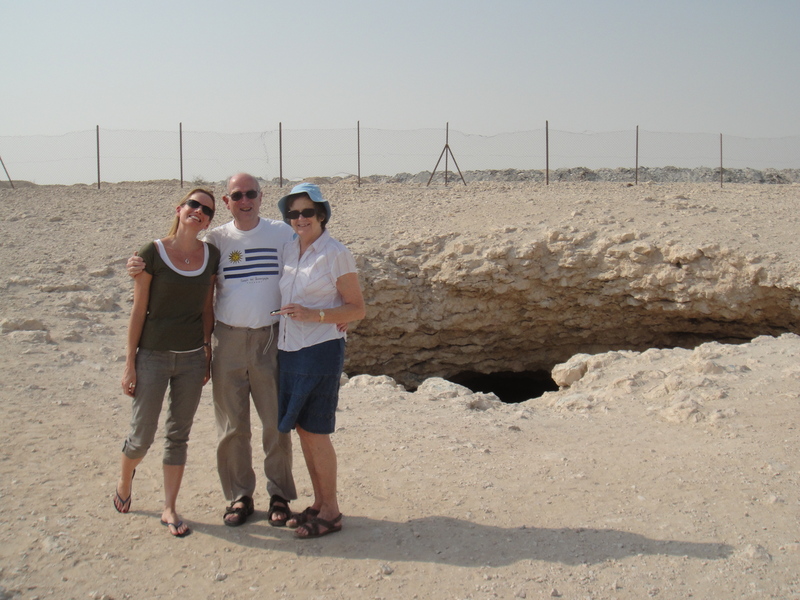 My parents came to visit and buildling on the success of the Zakreet trip on their last visit, this time I decided to show them another geological marvel of Qatar: the Musfer sinkhole. The fact that it was August and spending more than four seconds outside makes you melt, didn’t put us off…if only because our car had air conditioning. 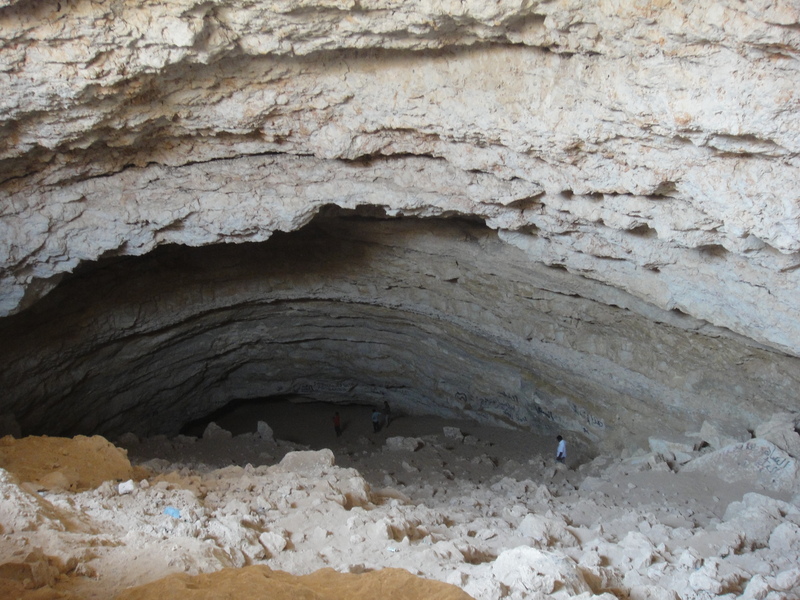 It was actually surprisingly straight forward to get there, we just typed ‘Sinkhole, Al Rayyan’ into Google Maps and up it popped! 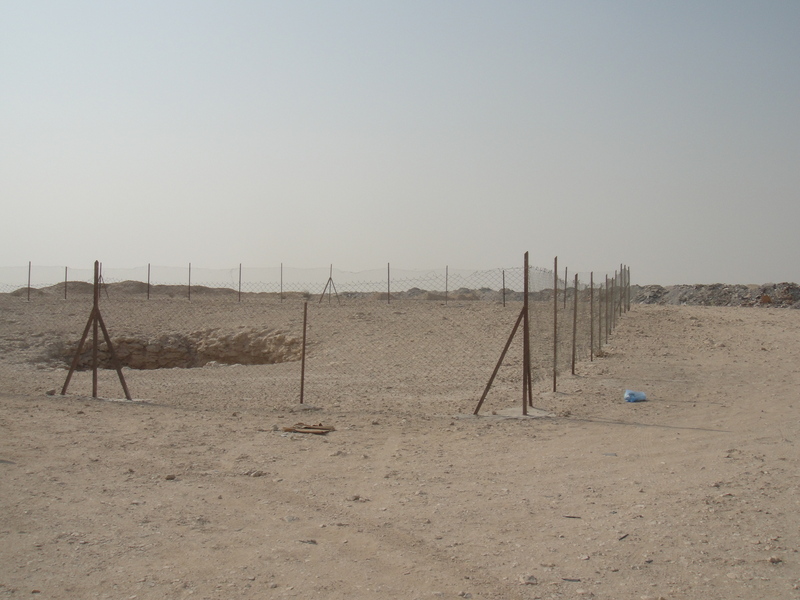 We drove down the pristine Salwa Road, then turned off and found the little signpost to ‘Umm Al Zubar West’. But don’t think a large pile of rubble is going to put us off! 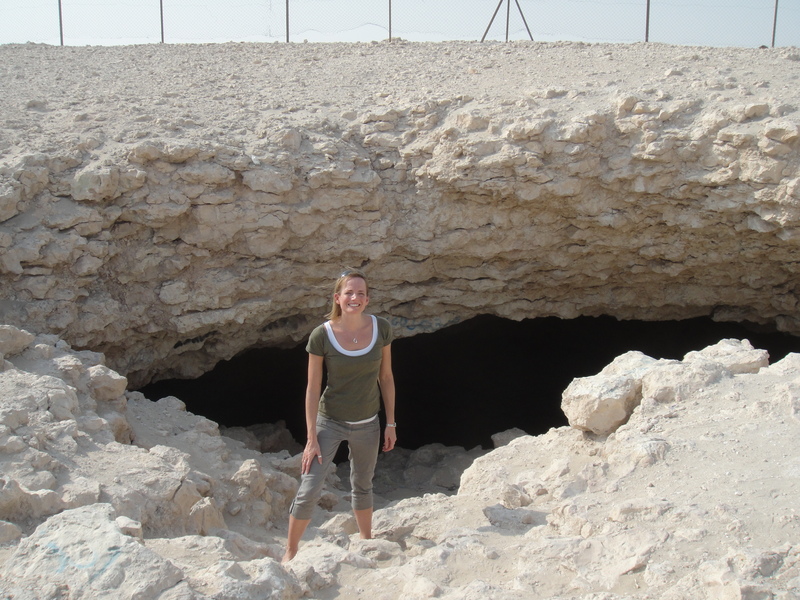 We ploughed on, and eventually turned off the ‘road’, and passed a camel farm, and came across the sinkhole. If you look carefully, you can see there are people at the bottom, which gives you some idea of scale. Inside the sinkhole it was also refreshingly cool, which was a blessing. I took my sunglasses off to have this photo taken and it was so hot that my eyes instantly started watering. The slightly sad thing, is that the sinkhole is right by…a huge rubbish dump. You can see the tip in the background, it’s the hill behind the fence. 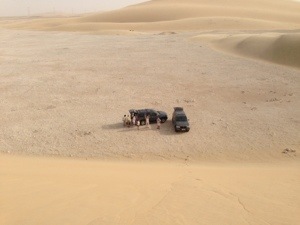 All of us, that is, except Felipe… who took the photo…and drove to the sinkhole…and generally looked after us! The first time you experience Ramadan in the Middle East, it can be a pretty strange time. All countries have their own rules, but in Qatar, work hours are reduced to 30 hours a week, eating during fasting time is illegal and all the opening hours of the shops change. But whilst 30 hours per week sounds great, in some companies you’re still expected to do as much work as usual. Some nice managers therefore will give you overtime, others will simply turn a blind eye. Eating in public between dawn and sunset is illegal, and punishable with a three-month jail term. I always worry that I’ll forget! The eating ban even includes drinking tea or water at your desk. Most offices will have a little room where you can go and eat a secret sandwich if you’ve brought one with you. It’s not a month to forget your lunch! The vast majority of restaurants are shut during the day. I can think of about three places that are open, who seem to be able to operate by blacking out their windows. The rest of the cafes and restaurants start serving when the fasting ends, which is about 6:30pm this year, and stay open until about 2am. 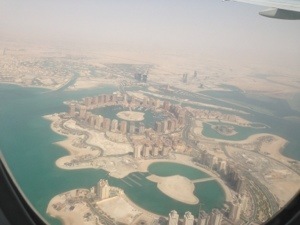 The bars that we have in Doha, which are almost all in five-star hotels, are shut for the month. Restaurants don’t serve alcohol either. The only alcohol shop in the country, QDC, also shuts. In short, if you haven’t stocked up before Ramadan begins, you’ll have a dry month! The larger supermarkets are open all day, but the other shops are all shut between about 2pm and 8pm. If you want to go shopping after work, it’ll be a late night! 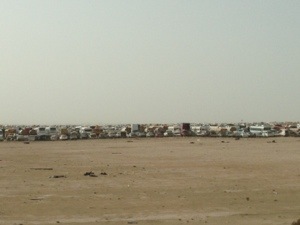 This is also when the majority of the traffic is on the roads, so expect it to take longer than usual to get anywhere. If you need to be on the roads just before the fasting ends, you are really taking your life into your own hands. People drive like maniacs, desperate to get to their meal. If you can, you should wait until just after 6:30pm, when there is barely anyone on the roads. This is the best time to go to the supermarket! Essentially night turns into day during Ramadan. If they can, people will have a siesta in the afternoon, then spend much of the night awake and eating. If you are waiting for a call from anyone, whether it be a doctor’s or a garage, expect that call about midnight. Just when Ramadan ends, and you’re beginning to think that a tipple in a bar might be the order of the day, another religious festival, Eid Al-Fitr starts, so everything stays shut. Fortunately, the closure of the shops and restaurants only lasts for one day and, even more fortunately, most people are given 3 days off work! That’s unless you’re a government employee, then it can be up to 10 days. Which days will be a holiday are only announced about 3 days in advance, so planning a trip abroad can be difficult, but time off work is always gratefully received! I’ve just been emailed a powerpoint presentation by the Ministry of Interior. It’s called ‘Safety in Ramadan’, so I assumed it would be about how to stay cool whilst fasting. It appears that they’re trying to cut down on the number of people who are killed on the roads (only drive before the fast-breaking meal Iftar at your own peril), and they’re also trying to stop people eating off food. My personal favourite is the advice not to wear nylon whilst cooking. Strangely though, nowhere does it mention the perils of over-eating (apparently 10 – 15 people are admitted to hospital every day during Ramadan). We just got back from the UK. It’s hot there at the moment. In true British fashion, people were complaining it was too hot. How I laughed! Too hot?? It was positively chilly! 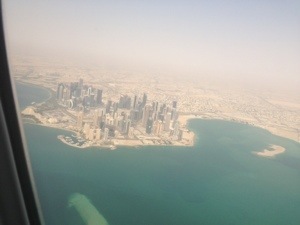 That’s about the temperature I have my air conditioning on in Doha! Twitter has automated systems that find and remove multiple automated spam accounts in bulk. Unfortunately, it looks like your account got caught up in one of these spam groups by mistake. I logged on yesterday to be told that they’ve suspended my Twitter account! The page pointed me towards a ‘Rule and Regulations’ page, which said I must have tweeted offensive tweets or attached some computer code to follow/unfollow large amounts of people at the same time. Given that I would have no idea how to set up a computer programme like that, someone must have been highly offended with my tweet saying the next few days in Doha were going to be windy. Please bear with me whilst I try to get my account reactivated. In the meantime, please feel free to start a #BringBackWeatherSteff campaign! 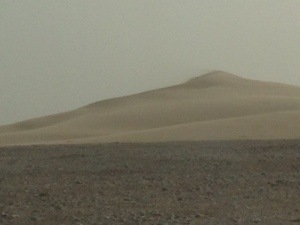 A few weeks ago, I arranged to go to the singing dunes with some friends of mine. The date was set for 17 May. As we got nearer the date, the forecast was for a really windy, sandy day…but what do you do? Do you let down your friends and not go, or just put up with extreme exfoliation? But it was futile. Our drinks had a layer of sand at the bottom, and the crisps had extra crunch. 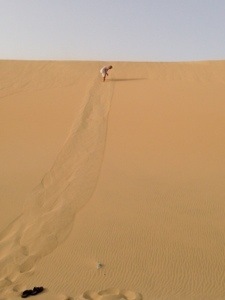 I added to my sandman look by sliding down the dunes and hearing them hum, before we headed home again! That’s not actually me in case you were wondering, but there are no photos of me up the dune as I was the only wally who got their phone out to take pictures. I don’t think my poor mobile will ever be the same again. And this sign at the new-looking hospital in Al Wakrah. 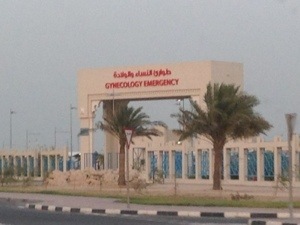 Yes that does say Gynecology Emergency. Is this a sign that it’s a very dangerous stretch of road? Is this an accident hotspot? Should we take extra care?! No. 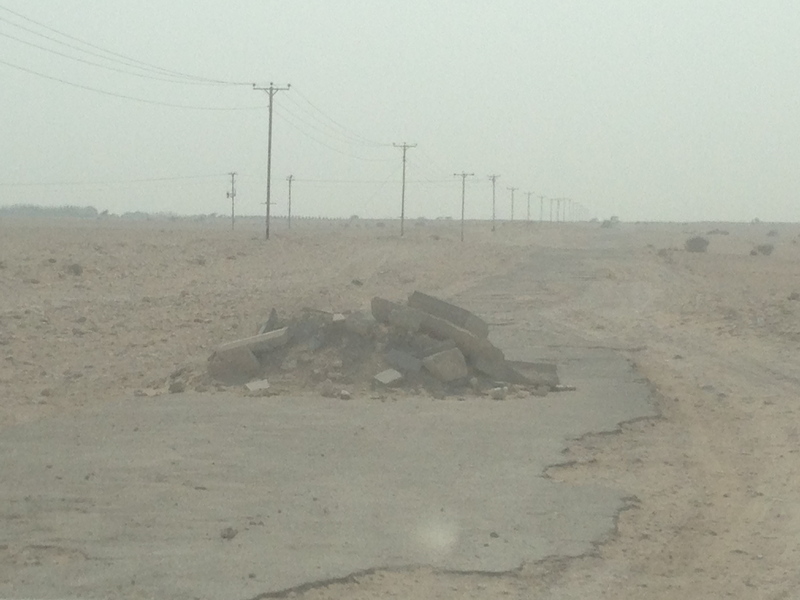 It’s a dead straight three-lane road. It’s just some people, late at night, like to go and skid their cars along the road.